We’d love your help. Let us know what’s wrong with this preview of Gratitude for Happiness by Ged Cusack. If you’re ready to make Gratitude your habit and build your happiness, now is the time that you must read this book. Do you know that most of us focus more on what we haven’t got, than what we have got? Just by switching your attention and focusing on what you have got, you can attract more of the same. Your gratitude muscles are like any other muscles, if they haven’t been used for a while they may need some warming up. A simple process to help you flex your gratitude muscles and build a gratitude habit to enhance your happiness. Individual exercises at the end of each of the sixty sections, to help you build your own gratitude statements. Four hundred and ninety sample gratitude statements (as guides) covering a wide spectrum of life, including: Finance Relationships Basic shelter And much more Three optional timeframes to develop your habit at your own pace. From steady progress or a set timetable to binge reading, you can decide. 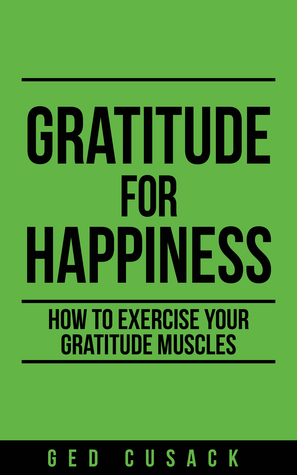 To ask other readers questions about Gratitude for Happiness, please sign up. We know what we should do, but how often do we need a gentle nudge to resume good habits? Gratitude for Happiness is that gentle nudge that encourages us to focus on what we have instead of what we feel is lacking. The book packs a wealth of insight, inspiration, and practical steps to building a lifestyle of gratitude. I felt compelled to grab a notebook as I was reading to capture the generous nuggets of wisdom and inspiration. I was especially captivated by the intimacy and authenticity of the author. Once you dive into the reading, you will quickly discern the author “practices what he preaches,” which adds value and accentuates the message. I won this book for free from Goodreads Giveaways. Thank you to Goodreads, the author and publisher for the ebook copy for review. As always, an honest review from me. My rating is actually 4.5 stars, but since there aren't half stars I round up. Gratitude for Happiness is a combination self help book and workbook. The format goes like this: chapters arranges by topic, sub topics that delve deeper into each category of gratitudes, explanations of each gratitude, examples from the author's life, a I won this book for free from Goodreads Giveaways. Thank you to Goodreads, the author and publisher for the ebook copy for review. As always, an honest review from me. Gratitude for Happiness is a combination self help book and workbook. The format goes like this: chapters arranges by topic, sub topics that delve deeper into each category of gratitudes, explanations of each gratitude, examples from the author's life, and prompts for the reader to determine topic specific gratitudes in their own life. The book is really user friendly. I have the ebook version and can easily write my gratitudes on a piece of paper. It doesn't hamper my ability to complete the exercises by only having an ebook version. If you prefer to keep your gratitude work right next to the explanations themselves, consider purchasing the printed version so you can write directly in your book. I also like that the book helps guide each person to create a mega list of many gratitudes and then narrow them down to what's most important to them. Very personal and unique! I read the whole book once through and am now going back to complete one gratitude exercise per day as suggested by the author. I really loved the examples in which the author reframes a negative thought into a positive one. It's actually a technique taught in therapy and can be quite helpful to many. Occasionally some of the author's examples seemed a bit redundant and specific to him. If someone was struggling to figure out their own gratitudes in a particular section, they may or may not be helped by the author's examples. A practical guide to changing attitude to GR-atitude in 21 days. Full of helpful suggestions, worksheets and an easy-to-follow journey to life-changing thinking habits. Definitely a great tool to stopping, appreciating the world and your opportunity to effect change, both for yourself and those around you. A very positive and enjoyable read! "The author of this book, Ged Cusack, wrote this book with organization, depth and clarity. From the very beginning, I knew pretty much immediately that it was going to be a good book.Cusack explains and shares his own personal life experience whilst relating them to researched and proven facts and discoveries. 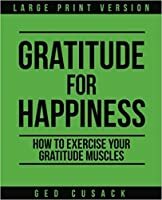 Gratitude for Happiness helps you to understand concepts and theories to help you transform your perception of certain areas of your life and even life situations, and to look at them in a "The author of this book, Ged Cusack, wrote this book with organization, depth and clarity. From the very beginning, I knew pretty much immediately that it was going to be a good book.Cusack explains and shares his own personal life experience whilst relating them to researched and proven facts and discoveries. Gratitude is so important, regardless of what your religious or spiritual beliefs are, and Cusack's book explains and reiterates this fact clearly, all while breaking it down into terms so easy to understand , that even a youngster could take in the information and actually benefit from it and put into use in their everyday life. As a child of the sixties, I've always had a thirst for learning and knowledge. Moving to New Zealand at the end of 2004 (After 22 years as British Military Engineer),I am enjoying the different pace of life. Since moving to New Zealand I have pursued many ventures including Business Coaching, Trading Stock Options, Trading CFD’s, Trading Foreign Exchange, Trading Futures and project management. I realized early on in my life, that I have a busy brain. Detailed notes and systems allow me to constantly move between projects. Realizing that other people can benefit from my systems and guides, I have begun to consolidate information for other busy minds. I previously spent 4.5 years working in post-earthquake Christchurch where my roles played to my strengths of project management, problem solving and systematization. At the end of that last contract I decided to have a break from the corporate environment and focus on e-commerce and trading. I had several friends and former colleagues ask what I was doing and how they too could start an Amazon business. After many hours of guiding those people (Involving providing schedules and identifying where these people where at) I decided to systematize this guidance. "A Beginner's Guide Profitable Stock Options Trading: Lessons I learned losing $100,000 to accelerate your trading success". I hope you enjoy reading the books as much as I enjoyed writing them.